Tonight I am going to see Blake Shelton!! Yay!! I actually could not stand him until about 2-3 years ago, when the TV show The Voice started and I began watching it with two friends of mine (one of which I’m going to this concert with). Now I love him and his music. Moving right along, ever since I made sriracha sloppy joes a few months ago, I am now obsessed with anything sloppy joe related (check out my Pinterest, if you’d like proof). 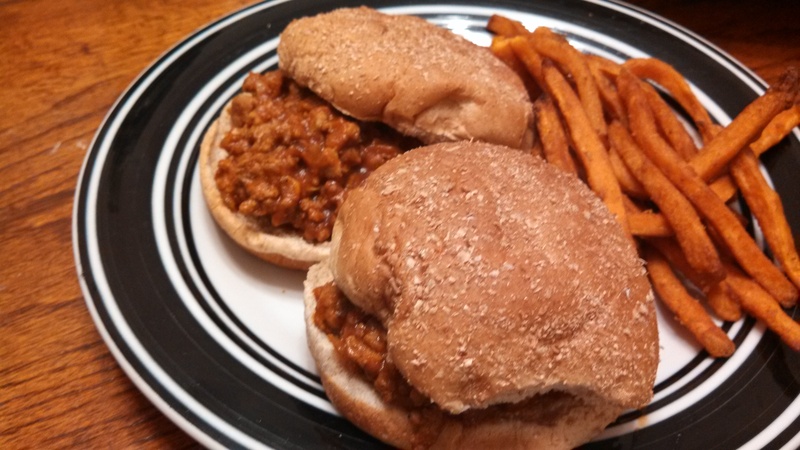 Yes, at the age of 29, I have discovered my love for sloppy joes. Don’t judge me. 😉 There is just something amazing about spaghetti sauce mixed with spices, chopped vegetables, and ground beef/turkey/etc. My good friend Alysha is probably shaking her head at me right now. Oh, there actually is one thing to note. The key is to let it simmer for awhile once all of the ingredients are combined. I am a huge fan of taste-testing while cooking, and when I tasted this at the beginning, it was really, really ketchup-y, but after I let it simmer for quite awhile, that dissipated and it tasted much better. Therefore, the key is to wait and let all of the flavours, spices, and other ingredients blend together while cooking. -In a small bowl, whisk together ketchup, dijon mustard, worcestershire sauce, tomato paste, red wine vinegar and tomato sauce, then set aside. -Heat olive oil in a large skillet over medium-high heat. Add the garlic and saute until fragrant, about 30 seconds. Add onion and cook, stirring as needed, for 5 minutes or until translucent. -Add turkey and cook until browned through, breaking it up as it cooks. Add chili powder, crushed red pepper, salt and pepper. Cook 2 minutes more and then add the ketchup mixture, stirring to evenly coat turkey mixture. -Simmer for 5 minutes more, or until thickened (I simmered at least 10-15mins, maybe more, to get rid of the strong ketchup-y taste). I’m not only shaking my head, I’m vomiting inside!! I almost marked this as spam by accident! Haha.